[prMac.com] New York, New York - Thailand's leading publishing company, Mass Connect Ltd., has added three of its best-selling titles - L'Officiel Thailand, World of Watches Thailand and L'Optimum Thailand to Magzter, the world's largest digital magazine newsstand. These magazines are now all set to reach millions of Thai-speaking readers all over the world. 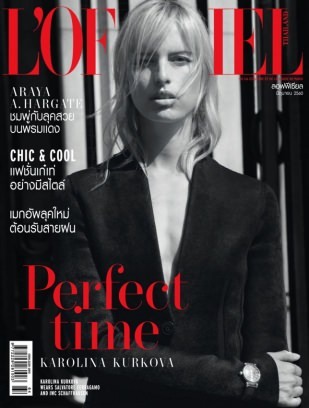 L'Officiel Thailand is the ultimate authority on fashion, jewellery, beauty and lifestyle. This monthly Thai-language magazine is priced at THB 1628.64 ($47.99 USD) for an annual subscription on Magzter. L'Officiel magazine from India, Singapore, Turkey, Russia, Malaysia, Spain, Vietnam, Philippines and Mexico are also available on Magzter. World of Watches Thailand, a bilingual magazine in Thai and English, features in-depth looks at the world's most detailed complications and layered reviews of current timepieces. This quarterly magazine is priced at THB 1017.77 ($29.99 USD) for an annual subscription on Magzter. World of Watches magazine from Indonesia is also available on Magzter. L'Optimum Thailand encompasses what it means to be a man. Aimed at witty, intelligent, and semi-rebellious pleasure seekers, the magazine utilizes both strong design and discerning content to create a dynamic publication. This monthly Thai-language magazine is priced at THB 1628.64 (US$47.99) for an annual subscription on Magzter. "We're quite pleased to welcome Mass Connect Ltd. to the Magzter family. They customize and publish some of the most popular magazine brands like L'Officiel and World of Watches in Thai language, thereby helping millions of Thai people enjoy reading world-class content in their mother tongue. With Magzter, the reach of these magazines are all set to exponentially increase." - Girish Ramdas, CEO, Magzter Inc.
"We've been adding a lot of prestigious Thai-language magazines on Magzter, and the titles from Mass Connect Ltd. have further strengthened our catalogue. We're thrilled to provide digital wings to a like-minded publisher, who is as excited as Magzter to break the geographical barriers and reach millions of new readers across the globe." - Vijay Radhakrishnan, President, Magzter Inc.
Magzter - Digital Magazine Newsstand 6.14 is free (with in-app purchases) and available worldwide through the App Store in the News category. All the magazines from Mass Connect Ltd. also come as a treat to Magzter GOLD users, who can enjoy reading them along with 4,000+ other international digital magazines. The Magzter app is also available on the web, Google Play, Amazon App Store, Kindle Fire and is expanding to more platforms soon. Magzter's easy purchase and renewal systems ensure subscriptions are paid on time, eliminating the need for paper checks and postal mail issues. Users can buy their magazines on any of the above devices/platforms and seamlessly port their purchases to any other devices, a feature unique to Magzter.